In 2010, Laws Stained Glass Studios installed (12) hand-stained pictorial glass windows at Three Springs United Methodist Church in Bristol, VA. The seven main windows (size 36" wide x 54" high) had the following scenes: the Nativity, Blessing the Little Children, the Baptism, the Wedding at Cana, the Garden of Gethsemane, the Crucifixion, and the Ascension. 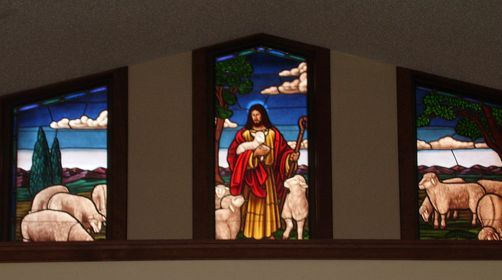 The three windows in the balcony area (size 24" wide up to 66" high) were all designed together into a "Good Shepherd" scene. 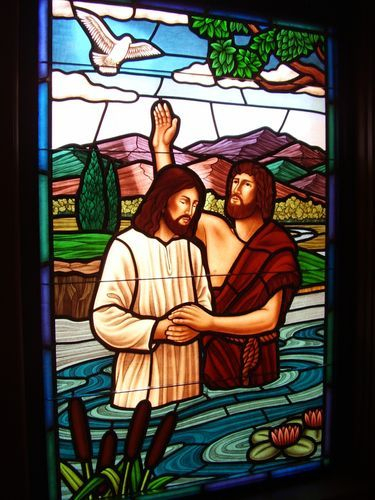 The two sidelight windows (24" wide x 82" high) depict "Jesus Knocking at the Door", and "Jesus Come Unto Me". For the main windows, Laws Stained Glass Studios removed the existing wood sashes that had Krinkle glass (fiberglass). The outside wood frames were covered with dark bronze flashing. On top of the flashing, new dark bronze aluminum frames were installed. On the interior, the leaded glass windows were set. On the exterior, 1/4" Lucite acrylic was installed as the protective covering. For the other windows, the stained glass and protective covering were set into the existing dark bronze aluminum frames. Hand-stained pictorial glass window of "The Wedding at Cana"
Hand-stained pictorial glass window of "The Baptism"
Hand-stained pictorial glass window of "The Garden of Gethsemane"
Hand-stained pictorial glass window of "The Blessing of the Little Children"
Sidelight window that depicts "Jesus Knocking at the Door"